ITT Cannon has introduced a high-performance, ruggedised and cost-effective cable-to-cable connector series for reliable connections in harsh environments. 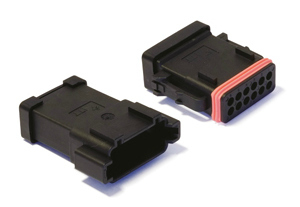 The CTC series of connectors is a simple-to-install, low-maintenance cable-to-cable interconnect that is suitable for a wide variety of harsh environment vehicle applications where reliable signal circuits are critical to operating performance. It uses the Trident T2P and T3P copper contact technology that enables contacts to be hand inserted and eliminates the need for sealing plugs and wedge locks. It is aimed at designs under the hood electronics, inside the cab and in chassis, controllers and lighting systems in a variety of heavy and off-road vehicle applications including construction, mining and agriculture, as well in trucks, buses and other automotive electric/hybrid applications. Demand for interconnect solutions with smaller space-saving footprints, reduced weight and higher pin counts is increasing due to the expansion of sensors and connectivity in heavy and off-road vehicles. The CTC Series is available up to a 24-way variant and can accommodate a wide variety of wiring schemes and harness layouts. The connector design features a thermoplastic UV-resistant housing, a simple locking mechanism keyed for blind mating, and a robust silicone rubber sealing system that delivers a tough, environmentally sealed connector with a sealing rating of IP69K. The CTC Series accommodates a wire range between 24-16 AWG, 0.20 to 1.50 mm2 respectively, and prevents misalignment by employing a polarization key for blind mating. The series is available in, 8, 12, 16 and 24-way variants.